Brenda Blakely recently posted this review of my book, The Predatory Lies of Anorexia: A Survivor’s Story. I have the privilege of participating in the Faithwriters Free Reads for Review program. 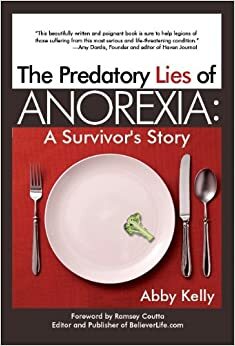 I am so very glad that one of the books I choose to read and review was Abby Kelly’s The Predatory Lies of Anorexia. Abby is a wonderful writer but this sensitive topic brought out a new depth of expression and insight. It was a learning experience from the GETGO. The book helped me to realize a lot of the questions in my own life had answers very different from what I expected and laid cautious thought before many of my pre-concieved notions. It also made me very aware of the dangerous lies we tell ourselves regarding the idols in our lives. Blessings as you read on for more. < LASTing Peace, Week 19, Don’t Look Back! Those are very kind words and I agree with everything she says ! So many people face so many different challenges in life and we don’t always realise it when we see or hear them. Learning from and gaining an understanding of the experiences of others is what brings us wisdom. Doing our best to help others with that wisdom is what brings us love. Love brings us joy. Glad to “have you back” David!! Missed you around here! Thank you for the kind words as well, and I whole-heartedly agree!